It’s a beautiful quote, but why do we have to take the good with the bad? Can’t God make it so that we only experience the good? 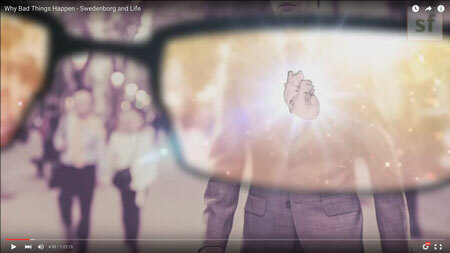 In this episode of Swedenborg and Life, host Curtis Childs and featured guests review Swedenborg’s written philosophies on the importance and consequences of free will and God’s role in the good and bad things that happen in our lives. Just as the heart is essential for the human body to live, free will is essential for humans to experience life. 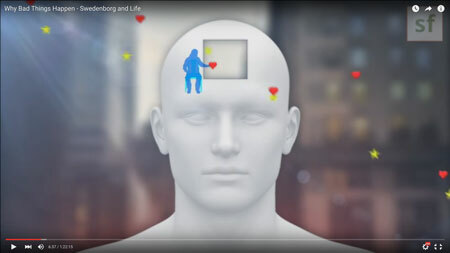 Curtis explains that according to Swedenborg, our will and intellect are the two primary elements of our soul, and each of these corresponds to parts of our physical bodies. Free will corresponds to our spiritual heart. We could not live if our heart stopped beating, and we cannot live a fulfilling life without the free will that is our spiritual heart. Curtis goes on to read two excerpts from Swedenborg’s True Christianity that explain the cause and effect of free will in our lives. This might lead to the obvious question: What would happen without free will? You see, the divine design was set up for the human race and God to connect, but a connection can’t be formed without mutual agreement. Without an agreement between both parties, humans would be nothing more than God’s robots, roaming the earth and living out his will. Choosing to follow a path towards heaven and God provides a deep and meaningful human experience. Curtis opens this segment by talking about calm in the midst of storms. You may have experienced this phenomenon in flight. Picture this: Your aircraft encounters turbulence from a storm, so the pilots ascend to get above the clouds to smoother air. You go from feeling tense and uncertain to feeling calm and assured. The storm is still happening beneath the plane you’re in, but the aircraft rose above it, thus relieving your negative feelings. Swedenborg describes a similar occurrence happening in the atmosphere of the spiritual world during turbulent times, which Curtis elaborates on in this excerpt from Spiritual Experiences. Theoretical nuclear physicist Dr. Ian Thompson joins the conversation to explain how the duality of calm and chaos can exist at once. The point to take away here is that storms occur on the outmost layer of our lives. Calmness and truth (God) always remain at the center. Curtis reads a beautiful excerpt from Secrets of Heaven where Swedenborg shares a spiritual experience in which he saw how the Lord works from what is peaceful in the middle to control what is chaotic on the outside. Curtis kicks off this segment by letting Swedenborg explain the “laws of permission” in his own words in Divine Providence. In essence, he explains that just because God allows something to happen, it does not mean that he wants it to happen. Curtis adds that because we are born with both good and evil, God cannot make choices for us, but he can continuously and steadfastly guide us in the direction of good—and he does. To illustrate this point, Curtis shares an image of how God operates through people, foresees evil and negative aberrations of his love, and makes adjustments to deal with the impending fallout, which he cannot stop. If simply knowing that God is at work in your life is not enough, and you want to know why God is there and what role he plays, Curtis provides some context in the next section. Why are evil people allowed to be successful? 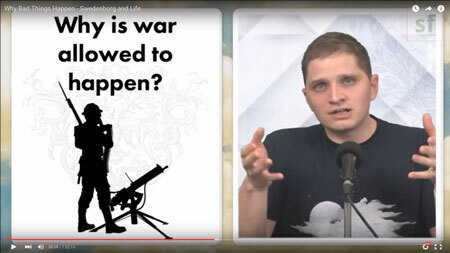 Why is war allowed to happen? Why is evil allowed to exist? Curtis shares some of Swedenborg’s answers to these frequently asked questions about Divine Providence at the beginning of this segment. 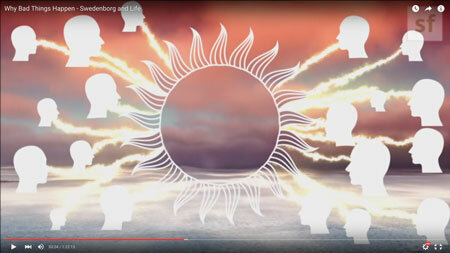 In this animated excerpt from Spiritual Experiences, Swedenborg talks more about God’s guidance and the relationship between heaven and hell in our minds. Even though we were born with hereditary evil, subjected to constant temptations from hell, and have to experience pain and suffering in life, it’s still possible to have a positive outlook, and Swedenborg even offers us the first step in the process next. 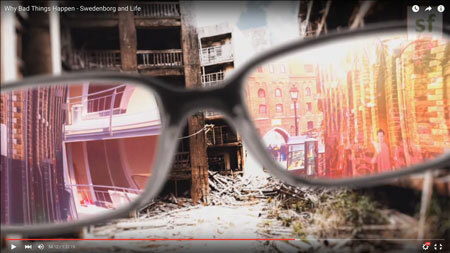 If you could look at the world through providence-tinted glasses, you would see everything, even devastation, in the best way possible. This is how God sees the world and our lives. In the midst of our pain and suffering, he sees the silver lining. Curtis explains that we can come close to living with this outlook too with the help of a few easy steps Swedenborg proposed. Step 1: Looking for God. If we’re open to God’s role in our lives, then we can begin to understand why he allows both good and bad. So why do we have to take the good with the bad? Because the bad creates freedom, and freedom allows our spiritual hearts to beat so we can choose a purposeful and fulfilling life through love for the Lord and others. Why can I pray for something for 10 years and then in five minutes someone can destroy it? It is as if whim trumps prayers. When someone’s free will is used to kill someone, will that person be allowed to be reborn? How can we live in free will and God’s providence at the same time? I am thinking that sometimes when bad things happen, we can use the pain to get closer to God. What else can we do with it? What does Swedenborg give as the true story of Job [in the Old Testament book of Job]? What does Swedenborg say about sensuality and how it’s to be renounced? I get how love of self is bad and that hate and jealousy are part of that, but I don’t get how sensuality is bad. How can one have peace inside when everything is falling apart on the outside? Can you explain what is the veil we have over our eyes that prevents us from seeing the spiritual?